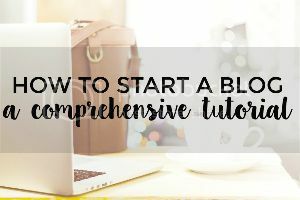 This post is designed to help you start a blog. I believe that blogging is the easiest, cheapest, and most flexible way to start your own business. What other business has a start-up cost of just a few dollars a month? What other business allows you to travel so freely? What other business allows you to work as little or as much as you want and still make money? What other business allows you to be a stay-at-home parent but still support your family financially? I believe that the answer is BLOGGING! I also believe that true financial freedom can’t happen UNLESS you’re an entrepreneur. If you’re not your own boss, you’re always going to be relying on someone else (or a whole band of people) for a paycheck. Why put your financial future in someone ELSE’S hands? While blogging isn’t a get-rich-quick scheme, making money blogging in your first year is totally possible. On my last blog, I was making several hundred dollars starting in my second month. One of my goals with THIS blog is to show you exactly how to do that! BUT…It’s all what YOU make it. If you start a blog now, you can start earning as soon as you want. The more you work, the more you’ll earn. This article is designed to get you started with a blog today. RIGHT NOW. *This post contains affiliate links, meaning that if you make a purchase from a link on this page, I may receive a commission. All opinions are 100% my own. Starting a blog is easy, but it requires a small financial investment and an investment of your time. If you’re okay with that, this is for you! Here’s a little bit about my journey to help you understand what it takes to start a blog and really “be a blogger.” If you just want to get started, scroll on down! Back in October of 2014 I started a blog about nothing in particular on WordPress.com. I didn’t have any direction with it, and to be honest I’m not really sure why I even started that blog (other than loving to write). But as I started reading more about blogging, I realized that things were way over my head. I was so confused. I couldn’t do all of things I saw other people doing on their blogs. I also didn’t have a great voice and a purpose for my blog. No defined audience, no goals, nothin’. I quit blogging entirely after realizing that way more went into blogging than I thought, and that I’d apparently set myself up on the wrong platform. If you’re new to blogging, I hope for your sake that you didn’t already make any hasty decisions like I did! If I wanted room for growth, I needed to be self hosted (meaning someone else isn’t handling the back-end of things). I needed to set goals and establish a niche. Blogging was still going to be over my head for awhile. I was certain I wanted to stick with it this time, so I was okay with it being scary. I am not a web developer. I am not a graphic designer. I am not HTML savvy. I was so overwhelmed by the things that I needed to learn. But those feelings of being totally lost were nothing compared to the feeling of excitement I had about blogging. 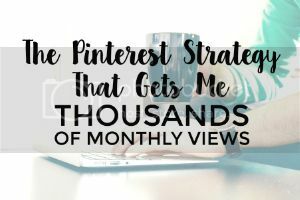 I had so many ideas in my head, and the idea of unlimited potential and possibilities had me jazzed about this blogging stuff. I spent hours researching “how to blog” and similar search terms, and have taught myself everything. And even though I was tempted to give up SEVERAL times (and I started over a lot), I’m pretty proud of that. I wanted to write this post to give encouragement to people who are thinking about starting a blog or who are in the first few months of blogging. Can I tell you a secret? I didn’t even know what a plugin was 6 months ago! Now I couldn’t live without them! You know what else? I didn’t even know what blogging was three years ago. I could go on and on about the blogging things that were totally over my head when I got started. I think I probably read 10 tutorials just to get my blog in existence. Truthfully, I had no skills, only a passion for writing and motherhood. That’s really all it takes. So if you are someone with any passion at all, you can blog! If it’s something you want to do for fun, that’s awesome! Most people that blog really enjoy it. But if you are someone like me, who wants to blog because they love it AND they want to earn money from blogging, I want to help you out. We’re all in this together. OKAY! Enough about me. Are you ready to start a blog?! Okay wait (sorry). One last thing. I want you to understand why you need to be self hosted instead of using a free service. When I had a free blog on WordPress.com, my website was “blahblahblah.wordpress.com” It was not only kind of unprofessional looking to have the word “wordpress” in there, but I also was super limited. Like I said before, I wanted to do all the cool stuff other people were doing on their blogs. I wanted to be able to have ads, customize the heck out of my blog, and use it for business purposes. This is where I’m going to break it WAY down for you, just in case you’re a blogging bonehead like I was. After really thinking hard and long about what you want to write about on your blog (it can be anything, if you’ve noticed, I talk about a few different things here at Busy Blogging Mom), decide on a name. This is serious business. I went through not two, not three, but six names before realizing that I needed to stop changing it every other month if I wanted to grow. You don’t want your name to be too limiting, but you do want it to shed some insight about you or your blog. Nothing too long, either. I started with the “StartUp” account and now have moved on to the “Grow Big” account, and I wish I would have just started there. You can have multiple websites, your site will be faster, and you can totally achieve 25,000 visitors before your first year is up. Your choice here depends on how much you plan to work on your blog. If you’re going to be working on it regularly and are serious about it’s growth, I suggest starting with GrowBig. If you’re really super serious, GoGeek. If not, you can begin with StartUp. I do want to make note of something – see the monthly price? That actually varies depending on how you pay, which you see on a later page. Most of the time, hosting services will be paid for annually, and you get a price break for that. The price you see on this page reflects an annual plan. Got it? If you want to start a blog but can’t pay the annual price, there is a one-month option but it costs more money in the long-run. For now, you can choose the basic plan and choose your extra services (you’ll choose a domain name soon!) I always get domain privacy because I don’t want randoms taking my personal info. If you start a blog using SiteGround, your first domain name is free with an annual hosting package. Type in the name you want for your blog to make sure that it’s available (someone else doesn’t already own it) and make sure that you have a .com site (like www.busybloggingmom.com). It will offer you .net, .org, etc. but if you want to look professional and you’re not an organization, it’s best to have a DOT COM. Alright? The next thing after you’ve chosen your domain name is to get to your cPanel so that we can install WordPress (where you will design your site and write amazing blog posts!). Scroll down to the “AUTOINSTALLERS” bar. Click the WordPress icon and follow the instructions. (I use the “http://www.” protocol.) You should pick a simple username to login to WordPress and a strong password. You can install a theme later if you want to. Once the installation is complete, click the little admin button to get to the login page! Are you there? TA-DA! Is your installation complete? Honestly, this is where things got confusing for me. But don’t despair! It’s like any new program, and you will figure WordPress out in time. Note: Basically, after paying for hosting, I hardly ever log into Siteground. I have to admit that it took me a long time to remember how to sign into my WordPress. Just be smart and bookmark it now! If you can’t remember how to find your login page, it’s usually www.yourdomainname.com/wp-admin. So for this fake one I used as an example, it was www.momneedschocolatenow.com/wp-admin. GO AHEAD AND SIGN IN! YOU HAVE A WEBSITE! Starting a blog isn’t so bad, is it? Granted…there’s nothing on it yet. You’ll be taken to your WordPress Dashboard now (which is where all of the magic happens). If you got through all of the steps so far, give yourself a little high five, because you made it! Now you can have fun learning, designing, customizing, writing, and more! If you want to go right ahead and install a cute theme, I recommend these! I hope that this tutorial has been helpful and encouraging to you. Please let me know if you have anything else you want me to add…and if you started a blog I would love to help you with it so don’t hesitate to contact me! If you want to learn more about blogging, check out the comprehensive Bold Beginnings eBook that guides you step-by-step on how to create a blog by clicking here! Or, SiteGroundget started by signing up with Siteground hosting and receive a significant discount now!